For the several generations previous, it has become customary for the Xeon equivalents of consumer processors to hit the market several months later. We saw the launch of Kaby Lake on the consumer desktop in January, with quad-core parts up to 4.0 GHz coming to retail. 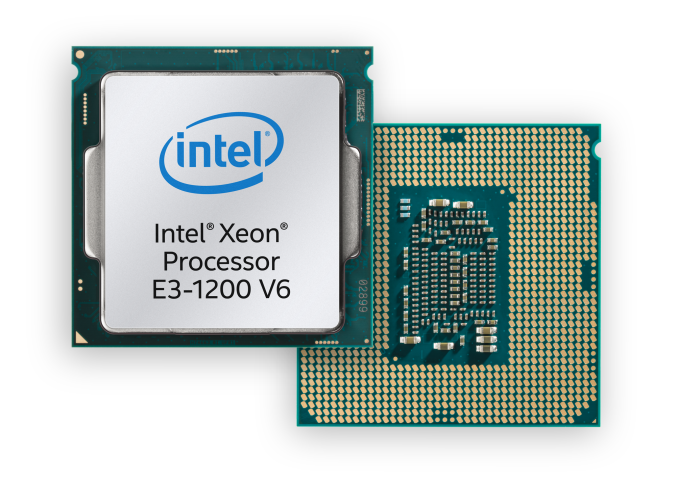 The Xeon E3 launch will be in the similar vein to previous years, designed for entry-level workstations, small business servers and storage servers, and Intel’s main comparisons for these Xeons will be to replace similar builds that are more than three years old. A total of eight processors will be launched today under the E3 v6 name, with some models receiving a corresponding low-power version later down the line. All desktop replaceable CPUs will be using the LGA1151 socket, the same as the previous generation E3 v5 Xeons. On the integrated graphics models, i.e. those ending in '5', are all running Intel HD P630 graphics and run up to 1150 MHz. This is the ‘professional’ version of the HD630 we see on the consumer parts, using Intel’s latest Gen9 graphics architecture and supporting H.265 encode/decode. Our Kaby Lake review piece goes into more detail. The high-end E3 v6 parts will have a maximum base frequency of 3.9 GHz base and a 4.2 GHz turbo. All the parts listed have a full 8MB of L3 cache, and either be 72W for non-IGP models or 73W for IGP parts. As with other previous Xeons, these come with ECC memory support, vPro and other technologies Intel files under the professional level. In Intel’s presentations, Intel SGX (Software Guard Extensions) are included, however TSX (Transactional Extensions) were not listed. 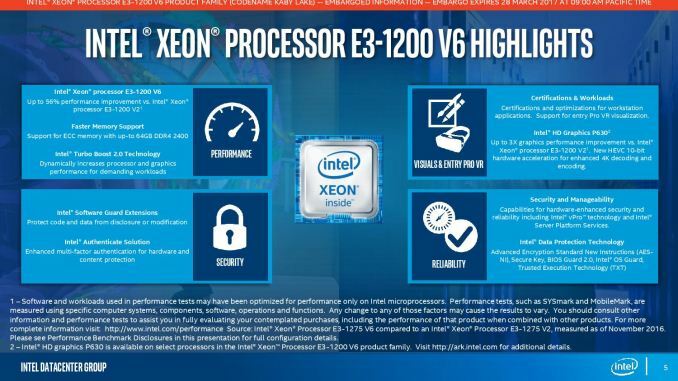 It is worth noting that for LGA1151 based E3 v5 Xeons, Intel adjusted the requirements such that Xeon processors require a server grade chipset on the motherboard. For Skylake E3 v5 parts, this was either a C232 or C236 chipset – we reviewed a few motherboards with these on (ASRock E3V5 Gaming, GIGABYTE Z170X-Extreme ECC). With a BIOS update, these C232/C236 motherboards should support the new v6 processors. For the E3 v6 line, Intel is not releasing new chipsets, deciding to stick with the C232 and C236 models. This means that users wishing to upgrade their E3 v5 system will have to wait for a BIOS update in order for the new CPUs to work. We have yet to receive word if the standard motherboard manufacturers are launching a new series of motherboards for this generation, however we suspect that several will do so. 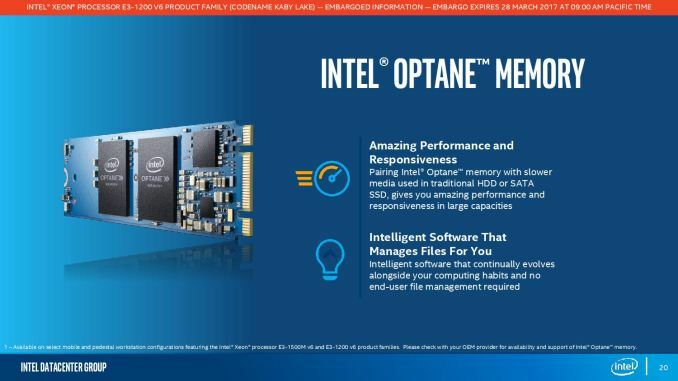 With the no new motherboard chipsets being launched, it is, therefore, odd that Intel is announcing Optane Memory support with the E3-1200 v6 Xeons. This essentially means that Optane Memory support is already baked into the chipset, and it is merely a firmware approval of a CPU and chipset combination in order for it to be enabled. Intel states that only select E3-1500M v6 (mobile) and E3-1200 v6 (desktop) configurations will be available for use with Optane, and may only be provided on an OEM basis. Along with Intel’s announcement, we are seeing systems being launched with E3 v6 processors installed. Intel did not supply a price list with their press materials, however we would expect prices to be equivalent to the last generation. To call out a big elephant in the room: Intel has more competition in this space than in previous years. Intel gives value to Xeon processors above consumer products, but Ryzen could potentially be an alternative to Intel. Aside from AMD, some of the positioning that Intel puts forward with the E3 could be taken up by Intel’s Atom offerings, Xeon-D, or even musings from ARM partners on new silicon designs. All being said, Intel is still expected to have the peak single thread performance for general purpose compute, and has the larger install base of customers and ready-to-go platforms. Performance per watt will be a key metric to monitor as well. We have the E3 v5 processors in for testing on our new CPU test suite, and we hope that the E3 v6 units will arrive in due course. Stay tuned for those.